It’s the time of year for spring cleaning, and Redmond police are taking the opportunity to clean up crime with a new program specifically designed for the rental community. “The intent of the program is to make the entire community a nicer, safer place to live,” Redmond Police Lt. Keith Knight said Tuesday. 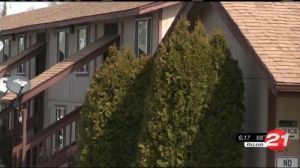 It’s called the Crime-Free Multi-Housing Program — a national effort now in Central Oregon for the first time. “When you put a lot of people together in a much smaller area, criminal activity seems to increase in those areas,” Knight said. The department is partnering with area property management companies to host safety workshops, with two main objectives. The first gives property managers the tools to make criminals unwelcome. “There (is) paperwork that would be signed by the tenant, that if certain criminal behaviors occur on the property, it would be immediate rights for the management to evict them,” Knight said. The second beefs up security around properties. “We will look at locks, peepholes on doors and how to make the apartments more secure, so that the tenants feel safer,” Knight said, adding that officers will give tips on landscaping and lighting. Participation in the program takes three steps. First, property managers take a one-day class at the police station. Then, police officers will perform a safety inspection of the properties, and lastly the department will hold a joint meeting with property managers for the tenants to tell them about the program and answer questions. Rock Solid Property Management owner Mary Hill is eager to get involved. “It will be good to hear the police officer’s aspect of what the criminal is looking for, so I think it’s going to help deter them from coming here and doing anything,” Hill said. Knight said the program aims to not only prevent crime, but also build more stable and lasting communities: neighbors who know and look out after one another. “You’re going to be bringing in long-term tenants, because they’re going to see the benefits of the landscaping, of the security,” Knight said. Classes on the Crime Free Multi-Housing Program are being held May 6th and 8th.